(下左) 7000系パノラマカー　白帯は座席指定車 (1989年3月撮影：新岐阜） (下右) 8800系パノラマDX (1989年3月撮影：犬山） (upper left) 8000 type DMU "Kita-Alps" went thru the JR Takayama Main Line. Photo at Mino-Ohta in Mar, 1989. (upper right) 8500 type DMU "Kita-Alps" replaced 8000 series DMU. Photo at Hida-Kosaka/Nagisa in Oct, 1994. (upper right) 5500 series EMU, the first air-conditioned commuter car in Japan. Filmed at Mikawa-Yatsuhashi in Jan, 1999. (lower left) 3850 series EMU Photo at Inuyama in Mar, 1989. (lower right) 6750 series EMU, the last one existed with old nose-susupension drive, filmed at Morishita station on 6 Jun, 2009. 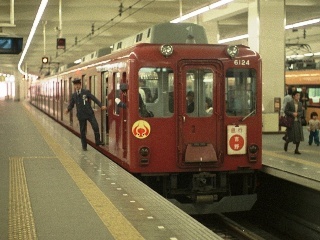 (upper left) 12200 series EMU, the "New Snack Car" without roll sign in front. Photo at Iseshi in Mar, 1988. (upper right) 20100 series double decker EMU for students tour. 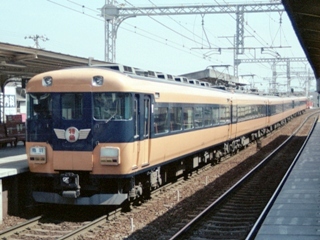 Photo at Goido depot in Apr, 1992.